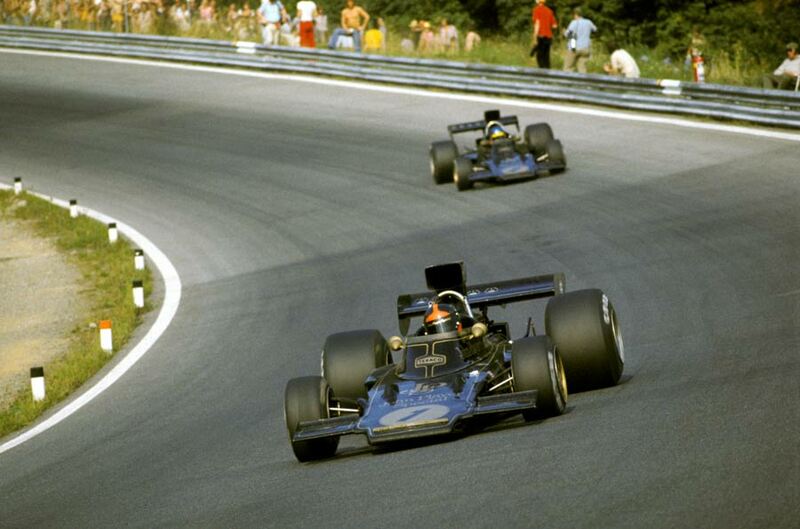 Ronnie Peterson took victory in Austria but Jackie Stewart tightened his grip on the title by finishing second in his Tyrrell. Emerson Fittipaldi claimed pole position in his Lotus, the Brazilian driver having recovered from a hefty accident at Zandvoort which injured his ankles. Second fastest was Ronnie Peterson's Lotus with the McLarens of Denny Hulme and Peter Revson on row two. Peterson led Hulme away at the start and then took Fittipaldi for second place but Revson failed to get away properly, causing a number of scrapes for the midfielders. Behind Fittipaldi, Jackie Stewart soon passed Arturo Merzario's Ferrari but team-mate Francois Cevert's Tyrell failed to follow suit and tangled with the Ferrari on lap six, putting him out of the race. Merzario continued but lost a place to Carlos Reutemann's Brabham but both moved up a place when Hulme pitted for a plug lead to be reconnected. Peterson relinquished his lead to Fittipaldi, who looked set for victory, until his car developed a split fuel pipe and he retired only six laps from the finish. It gave Peterson the win from Stewart with the Surtees of Carlos Pace third. Stewart now led the championship by 24 points.